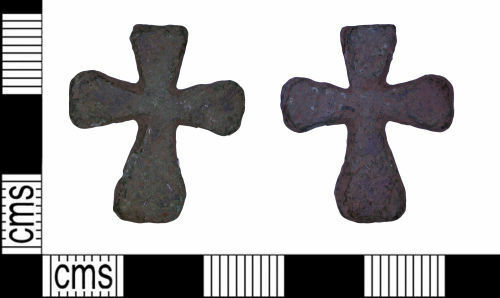 A Medieval or early Medieval copper alloy cross. The cross has four arms, the lower one of which is extended. Each arm tapers outwards slightly forming a trapezoidal shape. It has no obvious decoration and the upper arm appears to be damaged suggesting that it may have had a suspension loop here. Helen Geake (pers. com.) suggests that both crosses and pendant crosses sometimes appear in Medieval graves, but she suggests that it may also be of an earlier date as 'there is a similar sheet-silver cross from Lechlade grave 187, a 7th-century grave, which was found at the neck and probably a pendant'.